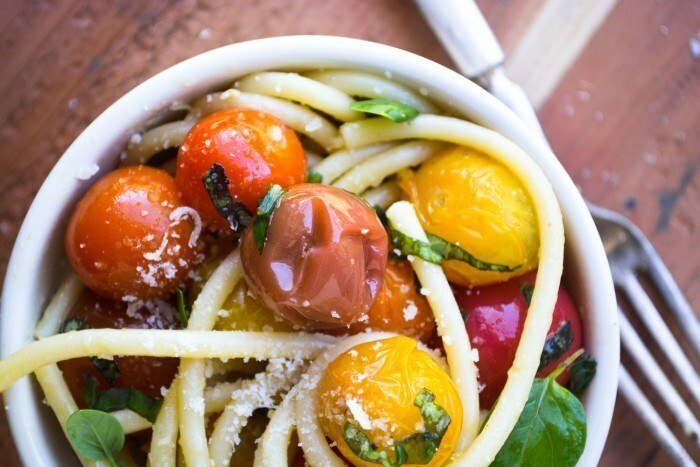 Bucatini with Burst Tomatoes is a gloriously healthy pasta recipe made with juicy, colorful cherry tomatoes and fresh basil ~ no matter what the calendar says, this recipe screams summer! Put a large pot of well salted water on the stove to boil. Cook the bucatini according to the package directions...I like to under cook the pasta by a minute or two because I like it firm, and it will continue to cook slightly in the sauce later. Wash the tomatoes and remove any stems. Add the olive oil to a large saute pan and heat it gently. Add the garlic and saute on a gentle heat for a few minutes, just to remove the raw garlic taste. Add the tomatoes to the pan and heat through, then add the wine. Bring to a simmer, then cover the pan and let the tomatoes cook for about 5-10 minutes, stirring occasionally. Cook them until they burst open and release some of their juices. 10 minutes should be plenty of time. Season with salt and pepper, and add the fresh basil. Toss gently but thoroughly with the drained pasta and make sure everything is heated through. Drizzle with a little more olive oil, and serve right away, with more fresh basil and some Parmesan cheese.